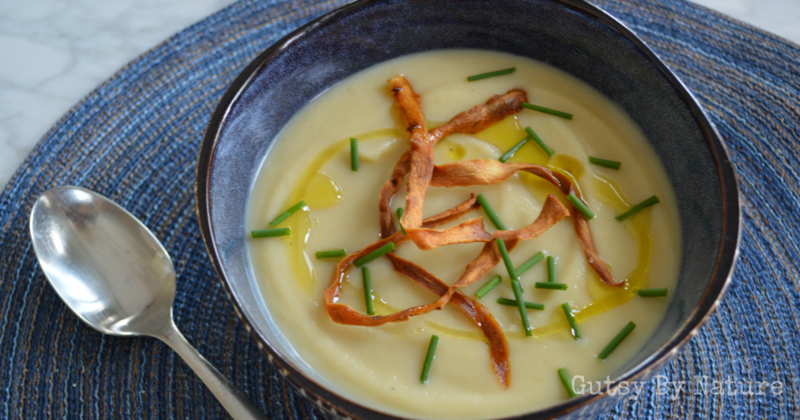 These two root vegetables combine to make a smooth and creamy soup with nary a drop of dairy in sight! Great for AIP, Whole30, and even vegan eaters. Use vegetable peeler to cut part of one of the parsnips into long very thin strips, resulting in about 1 cup of strips. Toss these strips with a tablespoon of the olive oil and toss with about ¼ teaspoon salt. Spread on a baking sheet lined with parchment and bake for about 30 minutes or until crispy and nicely browned but not burned, while you are preparing the soup. Cut the parsnips into chunks about 1-2 inches in size. Dice onion and chop celery stalk. Heat remaining 2 tablespoons of olive oil in a large saucepan over medium heat. Add parsnips, onion, and celery and cook, stirring frequently, for 4-5 minutes, or until lightly caramelized. Add garlic, bay leaf, and mace and cook for 1-2 minutes. Add turnips, broth, and ½ teaspoon salt. Bring to a boil, then reduce to a simmer. Cover and cook on simmer until everything is very tender (about 20-25 minutes). Transfer to a high speed blender or use an immersion blender and puree until very smooth. Garnish with parsnip chips, chopped chives, and a drizzle of olive oil to serve.